Click here to donate any amount to help us reach our goal. Click here and get a special thank you mention on the completed film's website. Click here to be the first to get latest updates and sneak peek of the film's progress and trailers. Click here to get the $35 donor advance download perk PLUS extra footage and interview videos. Click here to receive a souvenir poster of the film. (Extra shipping cost might apply if outside North America). Click here to get free ticket to a premiere. (We are not responsible for travel and hotel cost for premiere outside the supporter's town). Click here to get a premiere ticket for two. (We are not responsible for travel and hotel cost for premiere outside the supporter's town). Click here to get a special mention on the film credit. Click here for free video chat and interview after the film's premiere. Click here to dine with the director and/or film crew. (We are not responsible for travel and hotel cost for out of town supporters). Click here to submit video of you within 30 days after the end of crowdfunding campaign. Video could be used for either appearance in the film or the film's website (Director and crew reserves the right to choose and offer refund within 30 days after submission deadline if video is not going to be used). Click here to provide feedback / suggestion for the film. Director have final say and creative freedom but you will receive an Associate Producer credit for your help and creative input, whether it made the final cut or not. The Human Condition: Survival – Crowdfund Video with French Subtitle from KreyTor on Vimeo. NOTE: A new round of crowdfunding campaigh is now on at https://www.kreytor.org/BIG-OpenMovie and at Patreon. Follow either of the above link, or Twitter @MincomeBIGDOC for updates. UPDATE: The latest total funds received and settled is $1,135.00 (between April 2017 to July 15, 2017). The crowdfunding will remains open until we've reached the post-production phase. Any pledged amount that have not been remitted can still be forwarded at your earliest convenience. Volunteers from various artistic and production fields are still open (digital arts and animation, music and sound effects, researchers, and all types of positions). Please help us create an entertaining and informative Open Source feature length documentary to reach audiences worldwide. More updates about the progress of the project coming soon. Thank you all for your continued support. 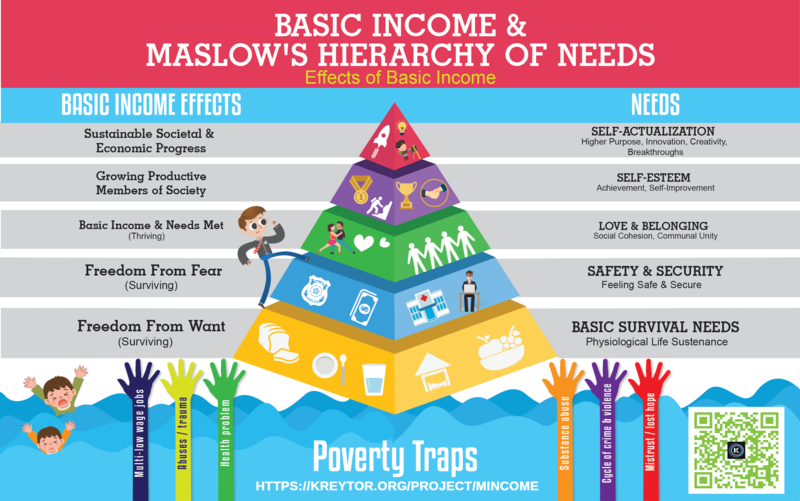 A concept infographic to be turned into an animated Basic Income Maslow Hierarchy for the documentary. The Human Condition: Survival from KreyTor on Vimeo. Dr. Martin Luther King Jr and Former President Richard Nixon on Basic Income from KreyTor on Vimeo. Whether you have heard of Basic Income or not, this independent film project will tell you an important story about Basic Income and the various experiments, including the Canadian Mincome experiment. An increasing number of economists worldwide are backing this concept, of guaranteeing every person enough money to survive on, as the solution to the socio-economic challenges of our time. Such a concept probably creates questions, doubts, or concerns in your mind like everyone else who has first heard of this.There are a lot of people who don’t understand why these economists would back it. The documentary will look at many claims about Basic Income. Will it eliminate poverty? Make government smaller? Make public services costs cheaper and more efficient? Will it promote arts, culture and technological innovation? Or increase the number of businesses? Will it be a better replacement for our current welfare system? And lower the health care and criminal justice cost? Is it a viable solution to impending job displacement due to the breakout of cheaper and more advanced automation and artificial intelligence? Mincome is the term used for a Canadian Basic Income experiment in the 1970s where everyone in the town of Dauphin, Manitoba was guaranteed an annual income. The experiment was backed by different levels of government. So what happened to it and why haven’t you heard about it? Our project dusts off the records in the archives by revisiting them with experts who have gone back to review the 1970s data from the completed experiment that was not analyzed until recently. Papers have been written that get economists from around the world excited. Please allow us to present the results in an entertaining full length documentary. Equipped with the same data the economists have, you can decide for yourself whether Basic Income is the solution for our time or not. The first of its kind, the documentary takes the viewer on a journey into the history of Human's survival. Stories of basic income experiments past and present, including the Canadian 1970s Mincome experiment, diving deep into the results and why the project was eventually abandoned. Drawing from the Manitoba example to worldwide case studies, the documentary also covers the principles of basic income from ancient to modern times, discussing the different perspectives on the costs and savings associated with various types of Basic Income. Delving into leaders who have supported the concept of Basic Income or Guaranteed Income with names of backers that will surprise you. What drives these prominent historical figures from across the political spectrum to support such a system? But this is as much a story about the past as it is about the future. We are passionate about this project and believe it has the ability to change lives and perceptions. We could have easily made this as a low budget documentary but we want it to be as entertaining as it is informative. We want it to reach as large an audience as we can in as many parts of the world as possible. We need funds to bring the right people and team on board. We have already committed our own funds and combined with funds raised in this campaign, we can create an engrossing and captivating independent film to fascinate the world and make it a widely discussed documentary. Our $30,000 base goal will enable us to create an entertaining documentary similar to the crowdfunding trailer. Some of the best documentary are acclaimed for their visuals first, and content or topic second. To produce the captivating visuals for the storyline, to backup the case of a documentary, would normally cost hundreds of thousands. We are confident we can do an entertaining piece under microbudget condition. But the more funds we get the more we can push the envelope to get the acclamation that will draw large audiences to watch the documentary. Now is the time for a detailed and honest analysis on basic income — the interest and momentum is growing around the world. There is increasing support from policymakers and ongoing debates about implementing pilot projects, which means we want to release this film as soon as possible. Kreytor.org or "Creator's Node" was created by us as a platform to crowdfund a project at very low cost. For independent filmmaker, every dollar counts so the high transfer fees, platform / services fees, payment charges could take a huge chunk out of the much needed cash. This is why Kreytor.org was established on July 1, 2012 and have been under development and beta testing since then. Aside from crowdfunding, Kreytor.org aims to be a platform to curate and showcase all forms of creative works, including civic and journalistic works (to be featured and produced under Civic category). Kreytor will also be used to produce and support films to entertain or spur debates and discussions. "The Human Condition: Survival" is the second production following the recent completion of our short film Trauma. This platform will also be used to share media assets that are originally created for our open source film projects. Stock footage and soundtracks produced during production will be made available if possible as we build a database of stock footage, sounds, and images. The goal is to share these creative works as quality stock archives that filmmakers could use. Any profit or payment for commercial use going directly to the artist, cutting out the middleman and their percentage commission or service fees. The footage and sounds or images produced for "The Human Condition: Survival" will be shared as stock archive if possible. Ultimately it will depend on the artist we work with or whose work we licensed from. The artist reserves the right to decide how their work are distributed and shared, and will have the final say. For the soundtrack used in this crowdfunding promo video, this was a collaboration between the director and Paul Cecchetti of www.paulcecchettimusic.com and we are making this music available for non-commercial use. For commercial use please contact us. We have been working on this documentary for several years now and conducted our first interview and fact finding on 2013. We are advancing the production with an aim to accelerate its completion. The interviews are done but more footage and post-production works needs to be done. Your help will allow us to complete this project sooner rather than later. 2017-05-03 Video clip of interview with Hon. Hugh Segal, Former Conservative Senator, Master of Massey College (University of Toronto), Special Advisor for Ontario's Basic Income Pilot. Hon. Hugh Segal talks about the bias against Basic Income by some people from both the left and the right. Hon. Hugh Segal on Right and Left Bias Against Basic Income - The Human Condition: Survival from KreyTor on Vimeo. You can read the discussion paper prepared for Ontario's Basic Income pilot >>here<<. This is a short concept clip of a story from a veteran who became homeless. Created after the 2016 North American Basic Income Congress at University of Manitogba, Winnipeg in Canada. Done under the old pre-production film title of "Mincome: Manitoba's Great Experimentt". The Story of Ron from KreyTor on Vimeo.